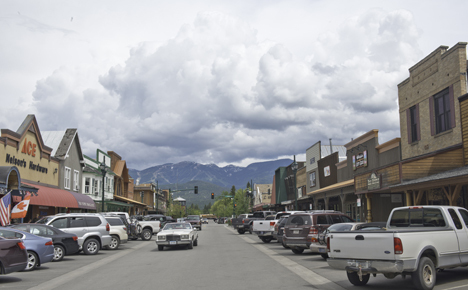 Whitefish, like other towns in the Flathead Valley, offers close proximity to year-round outdoor recreation. (See the full range on our Activities page.) In summer the outdoors is alive with events such as the "Lake-to-Lake Canoe Race" down the Whitefish and Flathead Rivers, and the Olympic-style "Summer Games" with sports ranging from rugby to mountain biking. Winter celebrations include the "Christmas Stroll" with carol singing, and the "Torchlight Parade" on the Big Mountain. Fall and spring are quieter times. Whitefish lies at the north end of the Flathead Valley in Northwest Montana along the shores of Whitefish Lake. It is just minutes from one of Montana's largest ski resorts, Whitefish Mountain Resort, and about 25 miles west of Glacier National Park. Main routes in are US 93, US 2, MT 40. Closest Interstate is I-90 to the south. Glacier Park International Airport is about 11 miles south, near Kalispell. Services include Big Sky Airlines, Delta Airlines, Horizon Airlines, Northwest Airlines and Holman Aviation (private charters). 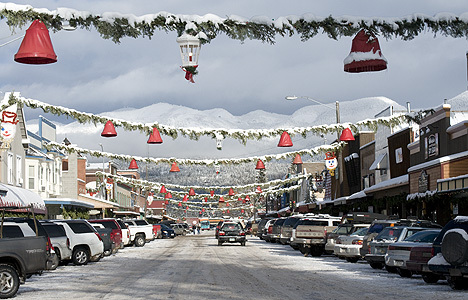 Looking north on Main Street with the Big Mountain in the background. A ski and summer resort offering winter (skiing, snowboarding, tubing) and summer (mountain biking, hiking on the Danny On trail system) vacation packages. Live cam view.